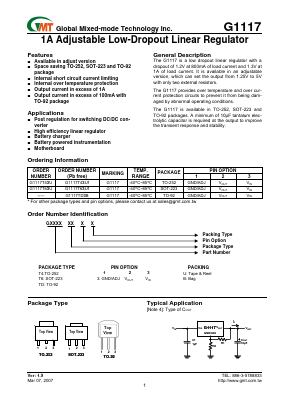 The G1117 is a low dropout linear regulator with a dropout of 1.2V at 800mA of load current and 1.3V at 1A of load current. It is available in an adjustable version, which can set the output from 1.25V to 5V with only two external resistors. The G1117 provides over temperature and over current protection circuits to prevent it from being damaged by abnormal operating conditions. The G1117 is available in TO-252, SOT-223 and TO-92 packages. A minimum of 10μF tantalum electrolytic capacitor is required at the output to improve the transient response and stability.